For Betsy Ramirez, I did a second project – the logo and website for Dinner Deployed, at www.dinnerdeployed.com. Dinner Deployed is a member-driven recipe website by and for military families. I was honored to provide my services for such a worthy project. For the logo, I wanted something obviously military and patriotic in feel, but not necessarily masculine. I feel the result is strong, but also fun. The flag place setting makes clear the theme of meals. The website itself feels warm, friendly, and approachable, just like the military support community should. 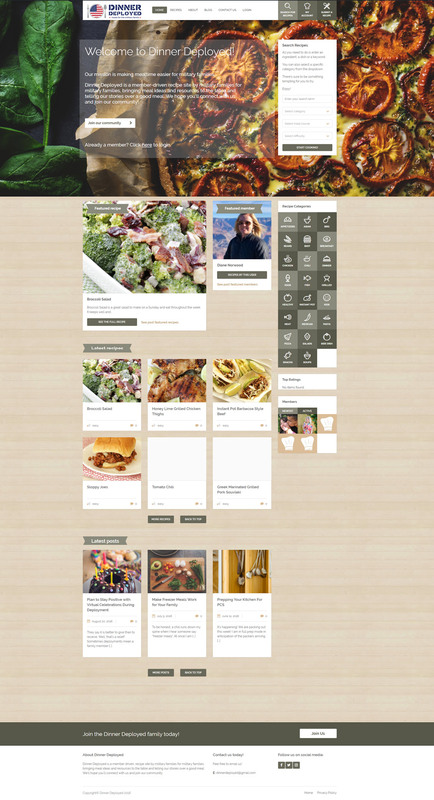 It is image-heavy, which is ideal for a website whose goal is to temp visitors to try new recipes and share their own. Just visiting the site makes me hungry!